The North Tower has fallen and the rebellion against the despotic Lords of Mydren is growing. Conlan wears the Royal Crown and, having proclaimed his ancestral entitlement to the throne as rightful King of Mydren, leads his army to destroy the East Tower. Yet the magical power of the Five is not the unstoppable strength it once seemed. One of their number is dying, their energy has become unbalanced and the elements themselves are stirring, pushing the Avatars into a dangerous gambit. Amelia is happy being a wife and mother, but her life is being torn apart by the man she loves, forcing her into a desperate mission to save him. She must travel the length of Mydren to find those who can aid him and convince them to help. Through internal struggles and external battles, Amelia will be ruthlessly tested. Will these trials forge her resolve into a weapon befitting an Avatar, or will she be crushed in body and soul? Can she find the belief and courage necessary to combat her own fears and protect those she loves? Her family needs her, and love is sacrifice, but is Amelia ready to surrender her entire being to the service of her King? 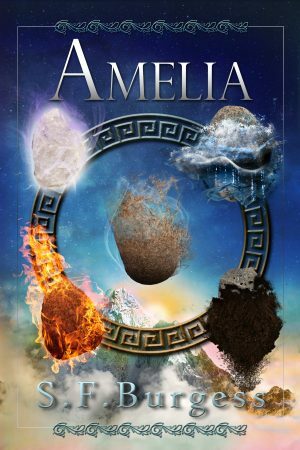 Amelia by SF Burgess available December 9th! For those of you who read Eleanor or Will a while ago and need a refresher before reading Amelia, here’s a link to a Synopses for Eleanor – MASSIVE SPOILERS FOR ELEANOR IF YOU CLICK HERE! And here’s a link to a Synopses for Will: MASSIVE SPOILERS FOR WILL IF YOU CLICK HERE!